Sure, anyone can give rise to an empire, just not on Sunday mornings... I need my sleep. Luckily with that mindset, I've never had to save my people from invading forces, and even luckier, the UK trailer for 300: Rise of an Empire is only sixty seconds long. That means it can be viewed in all it's brutal glory before my eyes close for another Sunday nap. Based on Frank Miller's Xerxes graphic novel, this trailer shows the same amazing 300 style cinematography is still in play (thanks to Zack Snyder), as the battle of spectacle and blood moves to the oceans. Shorter, yet more to the point than the US trailer, watch Greek general Themistokles (Sullivan Stapleton) try to unite his people, alongside Queen Gorgo (Lena Headey), as mortal-turned-god Xerxes (Rodrigo Santoro) and Artemisia (Eva Green), vengeful commander of the mighty Persian navy, try to destroy them. 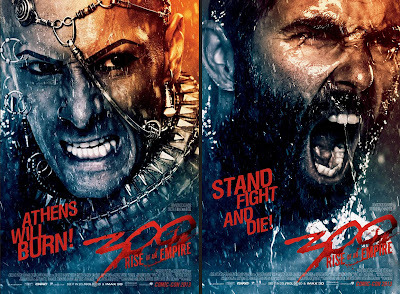 300: Rise of an Empire opens March 7, 2014. One of my friends, Julie, fancies Sullivan Stapleton like you wouldn't BELIEVE. The way she goes on about him, youd think she was married to him, and his series 'Strike Back' is never off the DVD player when I go round her gaff [gaff being an English term for house]. So if this movie entails him strutting about in loincloths or whatnot I might just give it a miss - me and my friends don't think we could handle the strain of another 'If I was in bed with Sullivan' rap, please God no. Not jealous in the least, of course. Of course, karl, you could always put on a loin cloth and strut about as Sullivan for Halloween. The movie looks beautiful, of course. I didn't really expect any different. I'll wait and see if it's as compelling storywise, or if it's just more cinematic eyecandy. With lots of Snyder splashy splashy. Thanks guys! LOL Karl, here it was that way when Gerard Butler was in the first movie. He is a big hit with the ladies down this way, and I'm sure equated for half 300's profits in this country alone. Talk about a teaser, Dan.